Next Week's Trivia... Lowry Park Zoo Tickets!!! Next Week&apos;s Trivia... Lowry Park Zoo Tickets!!! Hello gang, Jerm with a a quick update for next week! Trivia is back and you know that that means for three lucky winners next week! You guessed it, free stuff, and this weeks free stuff is going to be provided by our friends over at Tampa&apos;s Lowry Park Zoo. 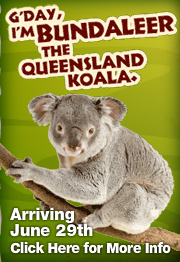 They seem to have a lot going on over there in recent months with the new website, being named America&apos;s #1 Zoo, and a new Koala exhibit featuring the lovable Queensland Koala Bundaleer! So be sure to check us out on Tuesday, Wednesday, and Thursday of next week where we will be giving away family 4 packs for each day&apos;s winners! We may even throw in a curve ball during the week and incorporate the giveaways around the new interactive game that Bundaleer came up with. That is one smart Koala, as he is a savvy tweeter and apparently knows how to create video games on his own website. Someone get that guy on the payroll please! I spent a good amount of time challenging other people on our Twitter site today to see who could get the highest score. At present I have to beat @thnx4noticn with a score of 27,000, so I guess I have my work cut out for me. For those of you that haven&apos;t heard, Bundaleer will be having his coming out party this Monday at the zoo. He got here early this week and wanted to get himself settled in before having guests over, so now he is ready to entertain guests! Well gang its time to make like a Eucalyptus Tree, and leave so I will see you on Monday at the Zoo! Stay tuned for more updates on our Tampa Florida attractions as well as fun things to do in Tampa Bay this summer!